Replacing missing teeth will not only help restore your smile and self-confidence, but also minimize the negative effects that tooth loss can have on your gums, jawbone and remaining teeth such as: shifting of the teeth, difficulty speaking properly, shift in occlusion (bite) and increased risk of tooth decay and periodontal disease. The following guide compares dental bridges and dental implants (the two most popular options available) by outlining their benefits and drawbacks to help you determine which one is the best for your situation. A bridge is a common dental restoration that can replace one or more missing teeth by literally bridging the gap they left behind. A fixed bridge is permanently cemented into place and can only removed by your dentist. It consists of one or more false teeth called “pontics” (one for each missing tooth) in the middle and one or more anchoring crowns called “abutment” teeth on either side (see diagram). The pontics (made from porcelain, gold, zirconia, alloys etc.) fill in the gap while the abutment teeth are secured to the natural teeth adjacent to the gap, holding the bridge in place. To connect the bridge to the neighboring natural teeth, the natural teeth must be shaved/filed down in order to provide space for the crowns to correctly align with opposing teeth and enough surface area to enable a strong bond/connection. The natural teeth must be relatively healthy (structurally sound and free from decay) for this to work. The biggest downside to this process is that it is irreversible. Once the natural teeth are modified, they cannot be used as regular teeth ever again. If you need to replace more than three consecutive teeth, you might be better suited to a removable or fixed partial denture. You can compare dentures and implants here. 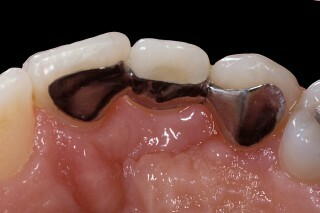 A cantilever bridge can be used if it isn’t possible to place a crown on both sides of a gap. This type of bridge is anchored by one or two crowns (depending on how much support is required/the length of the bridge) located on only one side of the gap. alternative is the Maryland (or resin-bonded) bridge. In this case, the pontic(s) have “wings” on both sides (see diagram) which are bonded onto the back surfaces of the adjacent teeth using a composite resin cement. These bridges aren’t as strong or permanent as the other types so they can pop off/fall out if subjected to too much force or wear and tear. However, this problem isn’t a big deal as the prosthesis can easily be cleaned and reattached. Another advantage is that unlike traditional bridges, they require minimal alteration of the anchoring teeth. Here is more detailed breakdown of the different types of bridges. 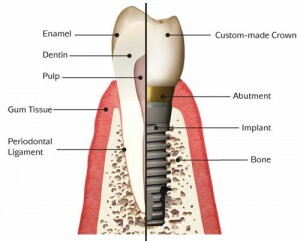 dental implant is an artificial tooth root (or “post”) made of titanium that connects to the jawbone and supports a crown. After being inserted into the jawbone via a short surgical procedure, the post must osseointegrate (fuse) with the jawbone so it is firmly anchored in position. Once the osseointegration process is complete (which can take anywhere from 3-6 months), an abutment is attached to the post. The abutment protrudes above the gum line and provides the surface that the dental crown is screwed or cemented onto. Two or more dental implants can be used to create an implant-supported bridge. They can be used to improve the color and shape of the teeth being replaced or covered up. Modern porcelain is extremely sophisticated and a skilled dental technician can fabricate a bridge that will closely mimic the natural translucencies and multiple shades found in natural teeth. They are a very common solution to tooth loss and a routine procedure for many dentists. A traditional bridge is around $700 – $1,500 per unit. A more detailed outline of the costs can be found below. The entire process can usually be completed in a few weeks. Preparation involves removing a considerable amount of tooth structure from adjacent teeth. Once this is done, these teeth can never again be used as regular teeth and must always be crowned. Removing some of the structure of a tooth increases the risk of it decaying and the need for a root canal treatment in the future. Bridges are covered by most dental insurance plans, so you should be able to reclaim a considerable percentage of the cost. Implants on the other hand are rarely covered by dental insurance. However, you may be able to claim at least part of the cost of the crown. Well-maintained implants will last for many years and typically for a patient who is 45 years or older, they are for life. The crown needs to be replaced every 10-15 years due to normal wear and tear, but the implant itself is permanent barring any uncontrollable circumstances such as accidents and diseases. Bridges typically need to be replaced periodically (every 5-7 years), but they can last up to 10+ years by practicing excellent oral hygiene. Bone and gum tissue loss will occur under a bridge where the tooth was missing/extracted, which can have a destabilizing effect on adjacent teeth. An implant on the other hand simulates a natural tooth root by stimulating the surrounding area with the forces produced by chewing, which preserves the bone and gums. A special type of floss and possibly other dental hygiene tools are required to clean underneath the pontics of a bridge and keep the area free from plaque. An implant also requires excellent oral hygiene, but can be brushed and flossed as if it were an ordinary tooth. Modern bridges look very natural, but as bone and gum tissue are lost over time, gaps can open up underneath the pontics. An implant provides the highest quality aesthetic results. The crown emerges from your gums in exactly the same way as a natural tooth. Start to finish, bridges are completed in two or three visits over the span of a few weeks. Implants require multiple visits over the course of 3-6 months and additional procedures such as bone grafts and sinus lifts are required in some cases. Each wing can cost from $250 – $550, while each replacement tooth ranges from $600 – $1,200. A typical bridge with two wings and one replacement tooth will cost from $1,100 – $2,300. A traditional or cantilever bridge costs around $700 – $1,500 per unit, or from $2,100 – $4,500 for a three-unit bridge (1 false tooth and 2 anchor crowns). A single implant will typically cost around of $4,000 (including crown and abutment). If used to support a bridge, the cost of 2 -6 dental implants plus the bridge ranges from $3,500 – $30,000 or more. A 3-4 unit bridge supported by two dental implants ranges from $5,000 – $15,000 (average of $8500). Making the Decision – Which Should You Choose? Best option if you are a candidate and can afford them. Implants are the longest-lasting method of replacing teeth and provide the best aesthetic results. They are expensive, but they are the best dental restoration method available and cost less in the longer-term because they don’t have to be replaced nearly as often as a dental bridge. In addition, an implant preserves the jawbone and gum tissue and doesn’t require healthy teeth to be grinded down. If money is an issue, please see these ways you can reduce the cost. Best if you are looking for a quick solution and want to avoid surgery. Implant surgery is not suitable for everyone. People who have medical conditions that compromise their immune system or how fast they heal are at a higher risk of implant failure (see this page for a list of contraindications). In these situations, a dental bridge will provide the most predictable and positive results. A bridge is also a good option if you want to avoid invasive surgery or would prefer to have your teeth replaced within a matter of weeks instead of months. Once you’ve decided, the next step is to find a good dentist. What did you decide was the best option for you? Let us know in the comments why you’re leaning towards implants or a bridge. I feel I am being rushed into an exorbitant cost of an implant: over ten thousand total dollars. My husband and best friend both have twenty year old bridges that are still working well. I am researching now to get the knowledge to present to my two dentists, the one who just diagnosed the infected root under a crown, and the other one so eager to do surgery and put bone in (which I find to be unacceptable). Thanks for the information. And a nine month time frame! Yikes. I do have other implants, and know that it is VERY expensive. I am researching dental implants to replace a cracked lower molar. The dentist informed me that my insurance covers the cost of the implant, but not the bone graft. The bone graft costs $1000! It seems that some implant procedures require a bone graft, and some don’t depending upon the condition of your jawbone. I guess they can’t tell without surgery. I’ve had my dental bridge (porcelain) in for 7 years now. A month ago the bridge got cracked and on my visit to my dentist, she said I must replace it immediately….like right there and then in her office! I felt like I was being rushed and did not appreciate it. We discussed my options and she told me other than replacing my bridge, I could consider implants. The quote she gave me for the replacement bridge was $6500 for 2 pontics and 2 crowns . The cost for the implants was $10,000. Implants were out of the question as I can not afford that I would have to go back with replacement of the dental bridge. I told her I will get back to her. So I have been online doing my research. It seems to me that the cost given to me for the dental bridge is high. Can you comment? Also, what other options can I consider, other than replacing my dental bridge? I am 59 years old. I will have a tooth pulled that had root canal and was capped. Unlike my other teeth with same, the root of this tooth was “angled”. Had my dentist tried to put a drain in, it would have ruptured the nerve causing paralysis in that area (PS: the tooth appeared straight). It was a root canal specialist who took a CT scan that saw the problem. The bacteria spread and most of the bone is gone…one or two millimeters from the nerve….so no implant. I am wondering if braces would help (I’m 70) as I had a bridge on the opposite side of my mouth after an auto accident in my 20’s killed one tooth, to prevent my teeth from shifting. As it turned out I never needed that artificial tooth. I have 16 teeth on the bottom and one of the front lower teeth was squeezed forward since the room allowed is only 1/3 the width of that tooth. After my tooth is pulled (5th tooth from center with two molars and a wisdom tooth on other side), could braces be used on that side of my bottom teeth to close the gap (or significantly reduce it)? That would then correct the protruding tooth as well.